If you can't find store bought jerky that's spicy enough, it's time to take matters into your own hands. Beef brisket gets a soak in a blazing habanero marinade before being dehydrated or oven-baked into jerky. 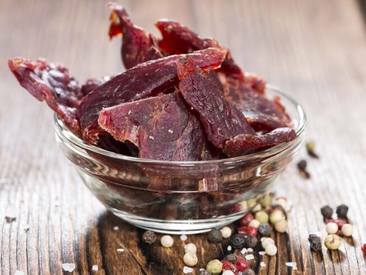 This hot & spicy jerky recipe from CD Kitchen is ade with beef brisket or venison, white onion, OR, onion powder, garlic, garlic powder, liquid smoke, soy sauce, Worcestershire sauce, steak sauce, monosodium glutamate, seasoned salt, black pepper, fresh rosemary, sugar, Habanero chiles, Pequin chile, hot sauce and cayenne pepper.